The perfect DIY project for spring, take your seedlings pot and all into the ground with this biodegradable craft! Biodegradable pots are the perfect way to house your new seeds! We guarantee you have the materials laying around the house. Just add your favourite seeds and some soil, and you have a great activity for you or your kids. Use one sheet of newspaper and fold it so that when you put your can on its side, it’s about 1.5-2″ longer than the can. Line the can up with the newspaper on one side. Some newspaper should be left hanging over the other end. Next, roll the newspaper around the can. 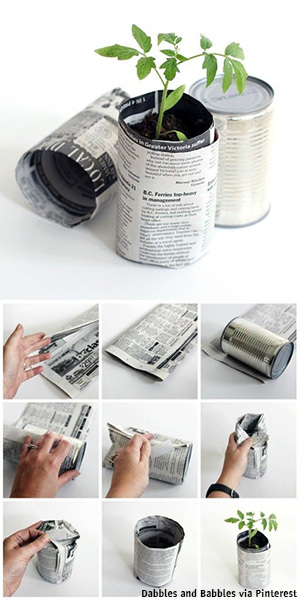 Make sure you don’t roll the newspaper too tight or you will have a hard time getting the can out. On the end of the can with the newspaper hanging over, fold over the newspaper towards the middle of the can until it’s all folded down. Push down the paper by turning the can over and pushing the can against a table or other hard surface. Remove the newspaper pot from the can. Fill your pot with soil and plant your seeds or seedlings. Once pots are full, you can put them aside on a plastic tray and water them. Nowadays, newspapers are made with vegetable based ink and therefore when you are ready to put these pots into the soil just go for it. Put them directly into your planting space without worrying about leaching unhealthy chemicals! If you're in Toronto, make sure you check out the Evergreen Garden Market for seeds and planting tools!